Home What Is Guitar Theory? Do you have a hard time learning songs, remembering their parts, and understanding their structures? Are you stuck in a rut trying to compose your own music? Would you like to be able to spontaneously improvise and jam? How many times have you learned something new on the guitar without quite knowing what to do with it? Have you noticed that many of the guitar instructional materials on the market feature lessons that teach you the “what” but not always the “why” and “how”? Without knowing how music works you are going to struggle with everything you do on guitar. Music theory provides you with the knowledge and know-how to bring all the elements of music together so that you can make music work for you and have complete control over what you play. Generally speaking, music theory is the study of music, its elements, and its workings. It’s the way you analyze, classify, and compose music and the elements of music. In the traditional sense, music theory also relates to the way that music is notated, the way music is performed, and the interrelationship between the two. You could say that music theory is the mechanics of music both written and played. While music theory pertains to music in general, guitar theory pertains to the guitar specifically. Typically, this includes only those aspects of music that enable guitarists to find their way around the fretboard, play music, and compose. You won’t get far on guitar without learning chord shapes, scale patterns, chord progressions, note positions, and intervals. You won’t accomplish much if you don’t understand keys, modes, harmony, chord relationships, and scale applications. Without some understanding of rhythm and without developing technique your playing will never take shape. Many players who don’t understand the inter-workings of music are limited in their ability to apply what they know. For example, a student might learn a new scale pattern from a scale book or a new chord shape from a chord chart but have no idea where it fits into songs. Without knowledge of how something functions it’s pretty much useless. So, what does guitar theory do? Guitar theory will explain what musical elements are, what they do, and how they fit together. For example, a new chord shape might be seen as an extension of a common barre chord. 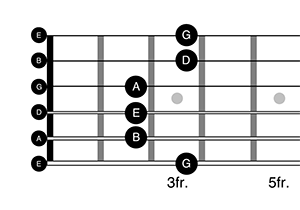 Wherever this common barre chord is played the new shape can be substituted for a new sound. A scale pattern might fit together with a specific chord progression. Each time this progression is used the scale tones can add melody and harmony. In music, knowing how the pieces fit together makes all the difference. The benefits of guitar theory include equipping yourself to play songs, compose your own music, and improvise. In music, a scale is a series of notes played in ascending and descending fashion. Scales are used to play melodies, riffs, solos, and bass lines. Scale notes make patterns on the fretboard, which guitarists finger and pick position to position. Successfully using scales requires more than simply memorizing their patterns, and this is where music theory, or in this case, scale theory, comes into play. Have you ever seen a guitarist learn the basic chord changes to a piece of music and then instantly begin improvising using scales? A skilled guitarist knows how scales relate to chords and can combine the two on-the-fly. Different types of scales produce different types of sounds from major to minor, from pop to blues. A versatile guitarist understands how scale modes work and knows what’s appropriate in any situation. Pentatonic scale pattern one, as shown here, is perhaps the most widely known and used scale pattern on guitar. It can produce a major, minor, or blues sound depending on how it’s applied. Try playing through these notes one at a time from lowest pitched note to highest pitched note, then reverse your direction. In music, a chord is a group of notes that ring together in harmony. One of the first things that beginning guitarists learn is how to finger a basic chord shape and strum across a group of strings. Chords are usually at the base of every song and help to establish the tonality of a piece of music. Chord theory is the study of how chords are built and how different chords relate to one another. This includes knowing basic chord structure, the difference between major and minor, the use of added chord tones and extensions, and the concept of voice leading. Guitarists make use of fragmented chord shapes, chord inversions, and chord voicings, and it all stems from their knowledge of chord construction. While simply memorizing chord fingerings is a suitable way to initially get started with playing guitar, getting to know chord theory is how you develop a working knowledge of music and become proficient as a player. One of the best ways to learn how chords are formed on the fretboard is to study the guitar-specific CAGED system. Chord theory also involves the study of chord progressions, which are the ways chords are put together to form a series of chord changes. As chords change they determine the music’s movement and a song’s structure. Composing a chord progression requires you to understand relationships between chords and concepts involving the way chords lead to and pass from one another. How is it that some guitar players seem to know what’s coming next in a song even when it’s their first time through it? Because chord progressions typically follow predictable patterns with their movements based on familiar scale structures and simple number systems. You get to know guitar chord progressions and playing by numbers by working with the chords produced by the major scale and its seven scale degrees.